Clinching time: The San Francisco 49ers can clinch the NFC West title with a win or tie against the St. Louis Rams. Seattle’s victory against Philadelphia means there are no other scenarios for the 49ers to clinch in Week 13. San Francisco can tie the 2005 Seahawks as the earliest-clinching NFC West team since divisional realignment. 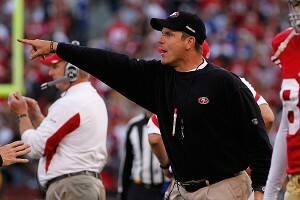 Head coach Jim Harbaugh has the 49ers pointed in the right direction this season. Harbaugh shifts into passing lane:With a victory against the Rams, 49ers coach Jim Harbaugh can improve his record with the team to 10-2. That would give Harbaugh as many victories in 12 games as Rams coach Steve Spagnuolo (10-33) would have after 44 games. Seahawks hitting snooze button:Having the Thursday night game this week meant Seattle was going to get extra recuperation time anyway. But with the team facing a Week 14 matchup against the Rams in the Monday night game, Seattle will get even more down time. Playing the Monday night game at home means there will be no travel, either. The effect is nearly the same as a second bye week for Seattle. Rookie record within reach: Patrick Peterson needs 76 yards in punt returns during Arizona’s game against Dallas to break Neal Colzie’s rookie record through the first 12 games of a season. Colzie had 633 through 12 games with Oakland in 1975. Comments at the time from then-Raiders coach John Madden sounded like something Ken Whisenhunt could say about Peterson: “Neal has unique ingredients for a returner. He’s big and still surprisingly quick. He can break tackles and run away from people. He has a good eye for finding a hole and darting through it.” Colzie never scored on 170 career punt returns. Peterson has four touchdowns in his first 31 punt returns. The rookie record for punt return yardage in a single season is also within reach. Louis Lipps had 656 yards with Pittsburgh in 1984. Kevin Kolb‘s return: The Cardinals rank third in the NFL with nine pass completions of at least 40 yards. Kolb, making his return Sunday after missing a month with toe and foot injuries, has accounted for six of those big plays. He’ll be facing a Cowboys defense that has allowed only three pass plays of 40-plus yards, second-fewest in the league. The quarterback metrics favor Dallas all the way. The Cowboys rank second only to Green Bay with a plus-27.6 differential in Total QBR gained (72.4) and allowed (44.8). The Cardinals rank third from the bottom in that category (32.4 gained, 58.5 allowed). On the positive side for Kolb, he gets four home games over the final five weeks, ample time to leave a positive impression.